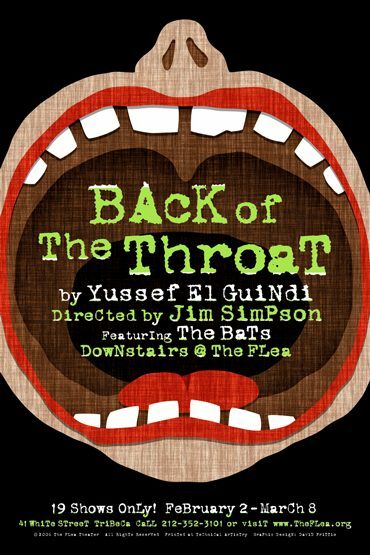 The Flea Theater presents the New York Premiere of BACK OF THE THROAT by acclaimed Arab-American playwright Yussef El Guindi. Produced throughout the US, this dark comedy about our rapidly eroding civil liberties won the 2004 Northwest Playwright’s Competition, was an American Theater Critics Association/ Steinberg New Play Award nominee and was hailed by the Seattle Times as one of the Best of 2005. Flea Artistic Director Jim Simpson directs. Previews begin February 2nd with opening night scheduled for February 11th. BACK OF THE THROAT begins with an innocuous Homeland Security investigation and quickly moves into a subversive discovery of fear, race, and the engine of suspicion. Following a heinous terrorist attack, an Arab-American writer is visited by two government officials. What begins as a friendly inquiry soon devolves into a chilling, full-blown investigation of his presumed ties to terrorists. At times surreal and comic, Back of the Throat examines the way in which facts, evidence and (mis)perceptions are used to distort the truth and how racial profiling impacts the relationship between the accusers and the accused. The play features member of The Bat Theater Company including Adeel Akhtar (who was interrogated by Homeland Security himself after his name appeared on a “no fly” list), Bandar Albuliwi, Jamie Effros, Jason Guy and Erin Roth with lighting by Benjamin Tevelow and choreography by Mimi Quillin. A native of Egypt, Yussef El Guindi grew up in England. Now an American citizen residing in Seattle, he has lived in the US since 1983. He holds an MFA in playwriting from Carnegie Mellon University and has taught dramatic literature and playwriting at Duke University. His plays, which include Ten Acrobats in an Amazing Leap of Faith, Karima’s City, Murder in the Mirror, and Men On Mars, have been produced nationally. His adaptation of Chekhov’s A Marriage Proposal, staged by the Arab Theatrical Arts Guild, was nominated for several PAGE Awards. His poem Crossing Borders was seen as part of Seattle’s Poetry and Art on Buses. Yussef’s short film Love Stalks won an award for best short narrative film at the Seattle Underground Film Festival.